Does your dog eat your couch? Does your dog pull on its leash? Whether you’ve just adopted a new puppy into your family or you’d like to work with a dog you’ve had for a while, our In-Home program may be the right choice for you! During our In-Home programs, your dog stays with our family at our facility. No matter what shape, size, or age your dog is, we’ll be happy to work with your dog! 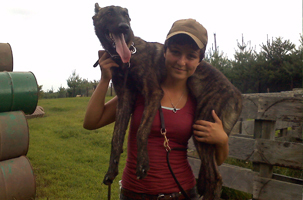 We approach each In-Home program with an open mind and take your individual wants and needs for your dog into account! Throughout your dog’s stay with our family, we’ll keep you up to date on your dog’s progress and send you photos of your dog participating in our program! Our In-Home programs last for a minimum of one month in order to allow you and your dog to get the most out of your training experience! 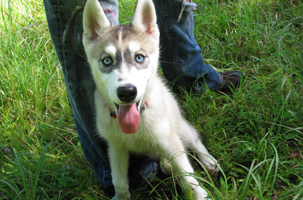 During your dog’s stay here, we welcome you to come out and learn with your dog! During the first week of your dog’s In-Home program, our primary goal is to become friends with your dog and to give it time to adjust to its new surroundings. We begin working on general manners with your dog and also begin teaching it the meanings of its obedience commands. We also begin socializing your dog with our other dogs and animals! During your dog’s second week with us, we take your dog’s training to the next level and begin expecting it to perform its commands on its own. 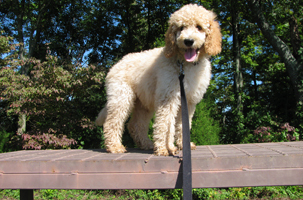 We begin with basic exercises and gradually prepare your dog for more difficult exercises. If you’re interested in pursuing agility training with your dog, your dog will be introduced to the agility course during its second week here! During your dog’s third week with us, we begin testing your dog’s responses around distractions and stressful situations. We believe in preparing our dogs for the stress and distractions of life by working them around the stresses and distractions of life! During your dog’s final week with us, we continue testing your dog’s responses to its commands around increasingly difficult stressful situations. We balance out difficult lessons with easy, fun ones to keep your dog happy, motivated, and challenged! No matter what, you and your dog’s happiness is our priority! By the end of your dog’s stay here, your dog will have been worked in the following areas to prepare it for its life with you! General manners We’ll discourage undesirable behaviors including nipping, pulling on leashes, jumping on people, and barking excessively. Basic obedience We’ll teach your dog a variety of obedience commands including sit, down, come, heel, stay, leave it, no, and hush! 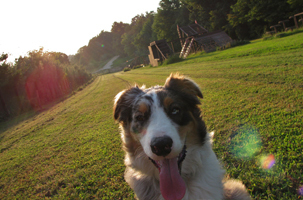 Basic agility We’ll teach your dog basic agility commands including up, jump, wait, turn, walk, and climb! Socialization We’ll introduce your dog to other animals including dogs, cats, chickens, and rabbits! Distractions We’ll train your dog around a variety of distractions including loud noises, other dogs and handlers, and cars! House manners We’ll teach your dog how to behave in the house and discourage behaviors such as jumping and chewing on furniture! Crate Training/Housebreaking We’ll work on housebreaking and crate training your dog in order to make it a more convenient family member for you! Having problems housebreaking your new dog or teaching your dog house manners? Our In-Home programs aren’t just for obedience! We’ll be happy to help you housebreak and crate train your dog! We offer a variety of In-Home options specifically designed to fit your needs! We also offer family/personal protection training through our in home program- Call now for pricing and details.